It wasn’t until high school when I truly started getting into fashion. My high school offered elective classes such as home economics, cosmetology, interior design, and my favorite, fashion design. Fashion design brings very fond memories and why I’ve been involved with it ever since. The atmosphere is up-beat and therapeutic at the same time. It was my safe haven. To be surrounded by such inspiring classmates and feeding off of each other’s positive energy constructing beautiful fashion pieces was what made it a hobby for me. I also loved how spacious and well-supplied the class was. The only thing I had to purchase was a beginner’s sewing kit and some fabric. My very first DIY project was a bit of a complex project for a beginner such as myself. I needed a lot of peer and teacher help. It was in my fashion design class where we had to make something creative and new out of a pair of old denim jeans. I decided to make a denim vest. What inspired me to make it were the girls at my school. Uniforms were a requirement and some girls would wear Levi’s trucker vests or fashion vests with their polo shirts and khaki skirts and skinnies. The casual denim vest and the dressy vest was so versatile to any style making girls achieve that cool tomboy look or girly-girl touch. I fulfilled the look by trimming off the pant legs, turning those pants into short-shorts and then only using the pant legs. After doing so, I cut the seams of the pants because I had to measure myself and shape the way the vest was going to fit my body. I used a measuring tape, tracing paper to make sewing patterns, and a white colored pencil so that I could cut off the excess material. Sewed it up and voilà! The picture on the right of the collage is the denim vest piece I made for my very first DIY. Some additional favorite pieces I made are also in the pic. I made the lace tank top when the lace trend was really coming in. Of course I put a color of my choice spaghetti strap to wear under it. Maxi skirts and hi-low skirts were also a really big trend that was being introduced for the spring/summer. Almost every girl had this in their wardrobe. 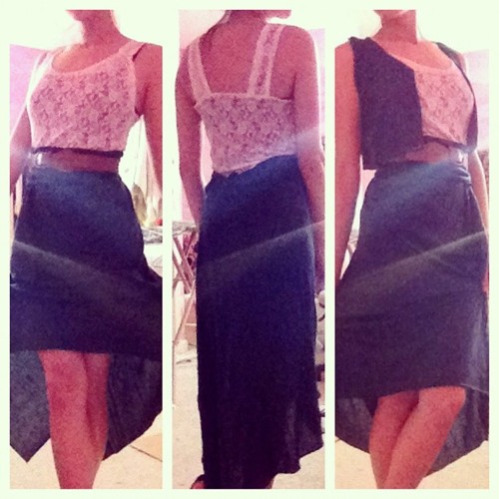 I was inspired because I loved how every girl began to look like a goddess strutting in these skirts. I had to get my own pair except I thought I’d just give a go at making my own. Super easy! What was your first DIY piece? Leave comments below to share.